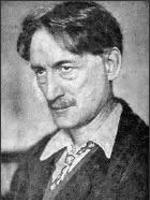 Henri Barbusse (1873-1935) was a French writer who wrote probably the most realistic French Great War book: Le Feu (1916; translated by William Fitzwater Wray in 1929 as Under Fire). He won the Prix Goncourt with this. The novel which brought about his entry in the Encyclopedia of Science Fiction is Les enchaînements (1925) (translated by Stephen Haden Guest in 1925 as Chains). It presents the protagonist’s visionary panorama of the prehistory and history of mankind, which is a history of constant suffering and struggle for freedom. Since the book culminates in the Great War, I discuss it where I discuss his War Experiences. Barbusse was born in Asnières-sur-Seine; according to Wikipedia his father was French and his mother English (Wikipédia does not mention this, but does add that he came from a traditionally Protestant family from the Cévennes). He went to Paris when he was 16; he published his first book, a volume of poetry, when he was 22. His novel L’Enfer (Hell) came out in 1908. He enlisted in the French Army in 1914, despite his age and ill-health: see War Experiences. Before the War was over, in January 1918, he moved to Moscow, got married, and joined the Bolshevik Party. In 1919, his novel Clarté was published (translated by William Fitzwater Wray as Light, 1929), which was about someone who joined the army and only later realised that this was an imperialist crime. He moved back to France (although he visited the Soviet Union again), and joined the French Communist Party. He became active in internationalism, communism and the struggle against fascism. His former friend Victor Serge denounced him for writing a book about Trotsky and for later denouncing him as a traitor. He wrote a book praising Stalin, and died in Moscow while writing a second one. He was buried in Père Lachaise cemetery in Paris. My information so far all comes from Wikipedia and Wikipédia.